Everybody has a bucket…and no, I’m not referring to the ‘bucket list’ of things you must do before you die. That list is likely more interesting than the bucket to which I’m referring. This bucket is the system or process that you know you need to fix or establish to manage your business but haven’t quite gotten around to implementing. In this month’s issue I will help you reveal what your own bucket is and what you can do to make it disappear. At Boston University I am the co-faculty director for a program called the BU Urban Business Accelerator. This program, started by a recent alum, Nathan Bernard, focuses on helping business owners in economically disadvantaged neighborhoods develop the skills and systems they need to manage their businesses “by the numbers.” Undergraduate and graduate students work with business owners in inner cities in Boston to implement QuickBooks and often a Point of Sale (POS) system for these businesses. Many of these business owners have very unsophisticated, and oftentimes nonexistent systems. The students were floored one day when the owner of one retail shop pulled out an actual bucket of hand written receipts for all of the items sold that week. The business owner understood the value of tracking his data in a more formal manner, but he simply didn’t have enough time nor knowledge to create a system. He was basically doing everything by hand because he didn’t know where to begin, which led to pricing, profit and inventory challenges. With thousands of SKU’s sold in this store, you can imagine the value of creating a computerized system to track how much each item costs, what it was sold it for and when to reorder (or not). It’s easy to look at this business from the outside and think of dozens of ways to improve it. But when we are working IN our business versus ON it, these growth challenges can surface quickly and have long and very hazardous impacts. We all have a ‘bucket’ that represents a part of our business that we know isn’t working efficiently. Oftentimes we know precisely how to fix it so…it’s just a matter of finding the time to do so. You probably don’t have a team of students ready and willing to identify and then fix your bucket, so it’s up to YOU to find the time to correct the problem on your own. Let’s face reality; unless you MAKE the time to correct the situation, you’re not going to easily find a few hours or days readily available to you. 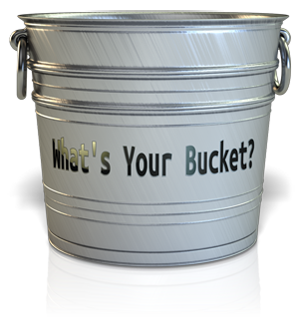 Identify your bucket – what’s the one problem you have that if corrected would make running your business easier, better or perhaps more profitable? Outline 3 reasons to fix it – how will your business improve or your sanity be increased? This is a great reminder of WHY it’s so important to do this NOW! Create deadlines and then simply DO IT! I’m off to address my own bucket. Curious? I’ve started teaching a few new classes at BU and at Brandeis this summer, but my schedule isn’t designed to prepare for classes, write my next book and manage my consulting projects. I’ve been working in a very non-linear, circular manner trying to get things done on time and it’s driving me crazy. I’m revising my own schedule so there’s time set aside literally written into my calendar (Yes, I’ve made appointments with myself) to prepare for classes and ensure that the first draft of book #3 (The Next Chapter: Turning Your Passion Into a Thriving Business) is completed by the end of the summer. Wish me luck!